Tony Levin's Utopia, Pieces of the Sun, and Ooze. The band has tried to capture all the magic of it's live shows on this recording. 112 minutes of intense playing - a mix of original compositions, songs that band members have played with Peter Gabriel and King Crimson. and some of the surprise twists (Tequila, Black Dog, Peter Gunn, L'Abito della Sposa) from various shows, that make the live performances of this band so special. The show is mostly instrumental, but Jerry Marotta sings lead vocals on Back in New York City and an unusual version of King Crimson's Sleepless. Tony has vocals on an Italian ballad, L'Abito della Sposa and, of course, Crimson's Elephant Talk. Phobos, from a former Synergy recording of Larry Fast, is presented here with full band joining "Mr. Synergy". And Tequila is, well... unique! When the California Guitar Trio opened the show in St. Louis, they joined in for a surprise encore - a distinctive version of Peter Gunn that was pretty special, so, though not multi-track, that recording is included too. 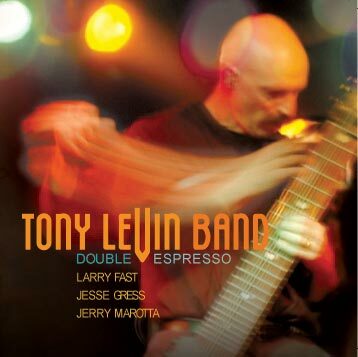 The performances were recorded (mostly at Bearsville Theater, Woodstock, NY) by Robert Frazza, who engineered the last two Tony Levin cd's. To insure the high quality rock live sound, for mixing Canada's Terry Brown was brought in. His credits include Rush and Bozzio Levin Stevens. Mastering is by David Torn, radical guitar player whose Splattercell mastering is in great demand.